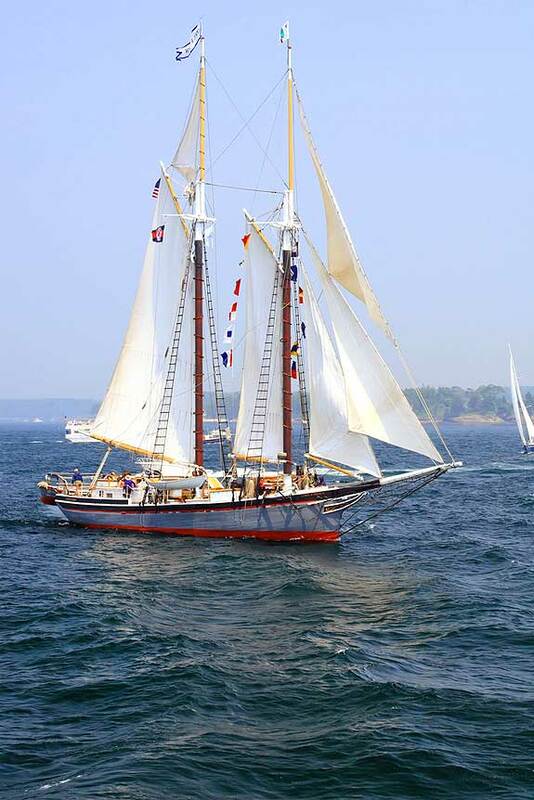 The Maine windjammer fleet sails from Camden, Rockland and Rockport. Pictured above: Camden Harbor. A Windjammer Cruise: It sounds like something you might only find in the warm waters of the Caribbean. A relaxed and laid-back island vibe instantly comes to mind. The Jamaicans have a name for this “no worries” feeling. They call it call it irie. You are sitting on the deck of the boat, barefoot, tanned, a rum punch in your hand. A steady trade wind fills the billowing white sails, and the ship is carried like a reggae beat across the open water from St. Thomas to Barbados and then on to the distant Grenadines. But do not be fooled. A Windjammer Cruise is more than just trade winds and Bob Marley. You can jam anywhere in the world, and cruising off the coast of Maine will not only give you an opportunity climb aboard a 19th century schooner, but to explore New England’s islands, hidden coves and remote harbors. Once you are out on the open sea, with the wind in your hair and the sun on your face, the water might be a little chillier, sure, but the feeling is still irie. 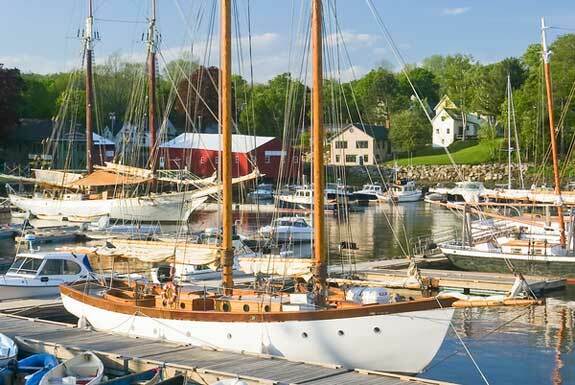 Old sailing vessels and tall ships were once commonplace in the harbors and coves of Maine. However, many of these cargo ships sat tethered and moored for years, neglected, the once beautiful boats becoming hulking wooden skeletons and casualties of progress and time. The golden age of sailing was in decline. As early as 1935, Frank Swift, a trained seaman and quartermaster, launched the idea of the windjammer cruise. It was during the Great Depression, and Frank Swift’s idea was a way to make ends meet. He fixed up and outfitted a couple of old schooners and began giving people tours around Penobscot Bay. At the height of his business, Frank Swift had twelve different vessels in operation off the Maine coast. 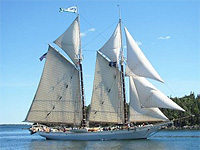 Today, there are fourteen members of Maine’s windjammer fleet. Every captain has either built or restored the ship that they are sailing, or has acquired the boat from a captain who did. In other words, the boats are safe and in compliance with every Coast Guard rule and regulation. All the windjammers have sophisticated ship-to-shore radios and high-tech radar systems. However, every ship in the Maine fleet is distinct and different, and choosing the type of boat you want to sail on during your vacation is just like determining what type of hotel you want to book. Climb aboard any tall ship in Maine’s windjammer fleet and you are going to find a slightly different sailing experience. Some boats have more amenities and creature comforts, while others are geared for a more stripped down sailing adventure. Most windjammers accommodate between twelve and forty people. Children younger than fourteen are only allowed on certain boats. However, several schooners offer special family cruises. From the Stephen Taber and Lewis R. French, both of which originally launched in 1871, to the Hallie and Matthew, which first set sail in 2005, here is a look at some of the most popular ships in the fleet. The Stephen Taber originally launched in 1871. It is the oldest sailing vessel in use in the United States. It is 68-feet long and accommodates twenty-two passengers. The Stephen Taber is known for its outstanding food and wine-tastings. It hosts an array of special interests cruises. The Victory Chimes was built in 1900. At 132-feet, it is the largest sailing vessel in the U.S. More importantly, it is the only three-masted schooner left in the U.S. It can accommodate forty passengers. At only 90 feet, the Mary Day is one of the fastest boats in the Maine fleet. It was the first schooner designed specifically for cruises and coastal tourism. This is a foodie’s dream ship, as the Mary Day offers New England style dinners. A traditional lobster bake is offered on the longer, six day cruise. Fresh baked goods are prepared in the galley’s woodstove every morning, and the ship is outfitted with both a fireplace and a parlor organ. The Mary Day can accommodate thirty people. The Lewis R. French also launched in 1871. It once carried cargo like granite, bricks and lumber along the east coast. The Lewis R. French was rebuilt three seperate times, the last time being in 1976. It is sixty-five feet long and can hold twenty-two passengers. One of the newer ships, the Angelique is 95-foot ketch that was built in 1980. Designed for the windjammer trade, the Angelique is modeled after a 19th century English fishing vessel. It has fifteen passenger cabins. Its highlights include a salon, piano and rowboats for shore excursions. Whether you opt for a three or six day cruise, your holiday aboard a windjammer will be filled with breathtaking scenery. From lighthouses and lobstermen to seals, puffins and whales, there is no telling what the day has in store for you. A glimpse of Poseidon riding his water chariot, a mermaid sunning herself on a rock…probably not, but there will be no shortage of tall tales and nautical adventure. Besides, who knows what sort of magic the sea has up its sleeve? One thing is for sure: You will spend most of your time meandering around the small islands and bays of mid-coast Maine. You will sail for about six hours a day before anchoring for the night in a quiet harbor. You are invited to take part in all of the ship’s activities. From hoisting and lowering the sails to taking a turn at the wheel, your tall ship experience can be as educational and interactive as you want it to be. If you would prefer just to sunbathe on the deck, then that is fine too. How do you pack for a trip at sea? Bring soft luggage that can be easily stowed. Steamer trunks are not allowed. In other words, pack lightly but thoroughly. Your list might look something like this: Comfortable and casual clothes, rubber-soled shoes, raincoats, shorts, swimming trunks, a sweatshirt for cooler evenings, hat, sunscreen, books, binoculars and a camera. Windjammer sailing into Boothbay harbor, Maine.